Located in the middle of National Part town. House is open plan, with all windows double glazed, well insulated. Captures all day sun. Very sunny and warm. Magnificent views of Mt Ruapehu from lounge and kitchen. Kitchen has all mod cons. After a hard day at the mountain sit back and watch the setting sun changing the mountain from white to pink and orange. AUTOMATED drying Cupboard. Woodburner in lounge, plenty of dry firewood. Enclosed carport making for a dry and easy unloading and uploading of vehicle. 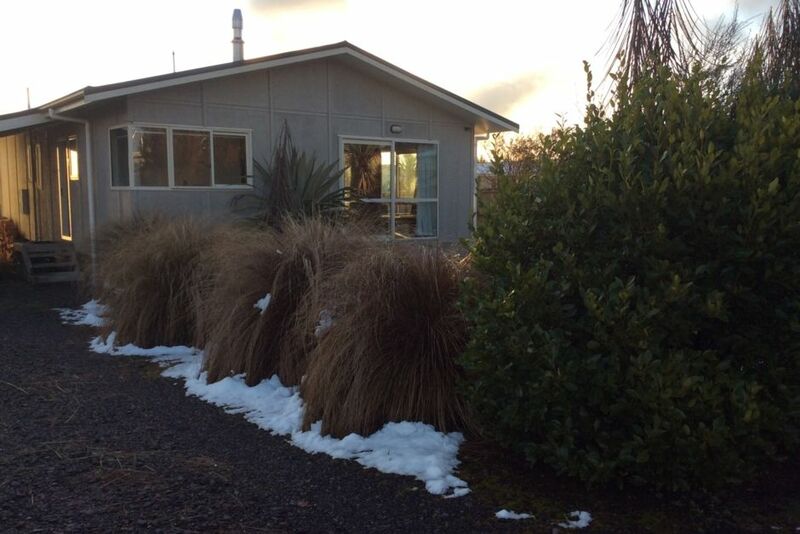 17 minutes to Whakapapa Ski field, 40minutes to Turoa ski field. 35 minutes to Tokaanu thermal pools. Easy Walking distance train station, cafe's, pubs and Rock wall climbing. Mountain Biking and walking tracks at doorstep. Tracks include Fishermans track, 42 travers, Tongariro Crossing and old coach road. Ski and Mountain bike hire Available in national park. Central to many mountain biking and walking tracks. Really enjoyed our stay at this place. It was lovely and warm when we arrived due to the all day sun and double glazing. Then we got to enjoy the fire on the cold days. The drying room was so handy for our ski gear. Had everything we needed and the beds were comfortable. Perfect for our family of 5. See you again next time. Great place to stay for a family of 5 with great fireplace, great drying room for wet ski clothes. Property was clean and tidy, matched description. It is conveniently just around the corner from train station where mountain bus picked up/dropped off. Great place to stay. Had everything we needed. Nice and warm. Great house, fire warmed it up perfectly.